Robert arrived in Rome in 1754, at the age of twenty-two, in the entourage of the newly appointed French Ambassador to the Holy See, the comte de Stainville, later duc de Choiseul. The monuments of the ancient world made a great impression on the young artist and it was while in Rome that Robert began his life-long fascination with ruins, both real and imagined. Such scenes formed the subject of paintings throughout his life and earned him the sobriquet 'Robert des Ruines'. The present pair of panels, painted in 1778, after Robert had returned to France, reveal his debt to the engraver Giovanni Battista Piranesi and to the view-painter Giovanni Paolo Panini, both of whom he met during his sojourn in Rome. Piranesi's celebrated Vedute di Roma began to appear from around 1748 onwards and a further set of etched fantasies, based on a detailed study of antique remains, was published in Opera varie in 1750. These proved highly influential to Robert's evolving style. 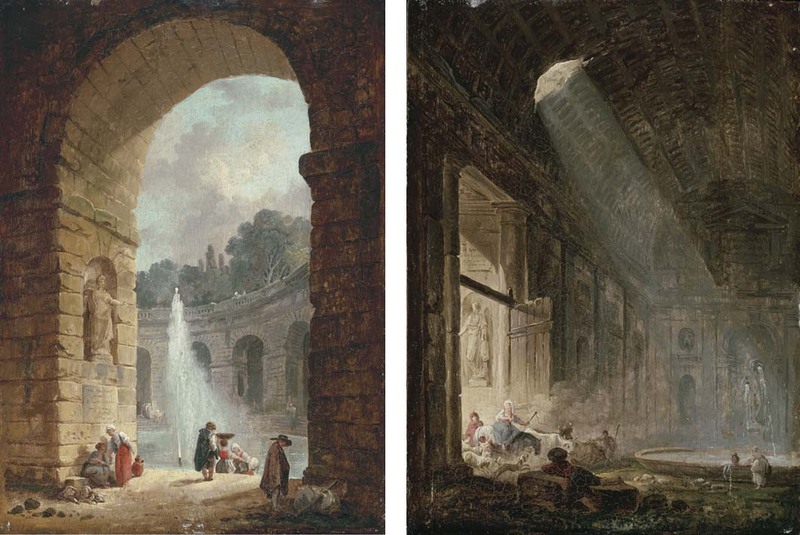 On his return from Rome in 1765, Robert became a regular exhibitor in the Paris Salons, and in 1779, among the twelve paintings he submitted that year, we find 'Deux Tableaux; l'un fontaine antique; & l'autre, un Palais ruiné...'. These pictures were larger than the present panels, but show that Robert was certainly producing variations on the theme of the ruined palace and the fountain in an antique setting at this time. Parallels can also be found among the pictures by Robert in the Hermitage, Saint Petersburg, which houses the richest collection of his work in the world. A similar arch, depicted from the opposite viewpoint can be seen in Landscape with an arch and the Dome of St. Peter's in Rome, dated 1773 (inv. no. 7733), and the motif of the circular arcade is present in Decorative landscape with an obelisk (inv. no. 7734). While the ceiling of the ruined palace is reminiscent of the dramatic Interior of the Church of San Martino ai Monti, Rome (inv. no. 8693).